This steakhouse features live jazz and a special bar menu in its cowboy-ish freight car lounge. : Located right in the San Juan Capistrano train depot, The Vintage Steakhouse has a look that does a nice job of capturing the old-school glamour of the golden age of railroad travel. Diners can board a restored 1927 Pullman car to enjoy signature dishes like the roasted white corn and tomato salad, mesquite-grilled rib-eye steak, and a starter of Gulf prawns sautéed with Pernod, basil, garlic, tomatoes and Chardonnay. Lunch offers up such options as the bistro burger, salmon béarnaise and mesquite-grilled chicken finished with a fresh tomato and mint sauce. Peanut butter crème brûlée and profiteroles rolled in cinnamon and brown sugar are just a few of the dessert selections. 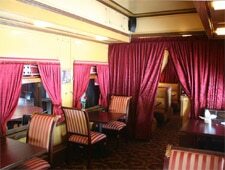 The restaurant also features live jazz and a special bar menu in its cowboy-ish freight car lounge.